Toxic effects of Nigella sativa against Rhyzopertha dominica (Coleoptera: Bostrichidae). Citation: Ali Z, Mazhar U. Toxic effects of Nigella sativa against Rhyzopertha dominica (Coleoptera: Bostrichidae). J Agric Sci Bot 2018;2(4):3-6. This study was conducted at the Institute of Plant and Environmental Protection, Insect Pest Management Program (IPMP), Stored Grain Management laboratory (NARC) Islamabad in 2018. The Insecticidal effects of essential oil i.e. Nigella sativa at the concentration of 10, 4, 2 and 1 percent showed insecticidal effect (as high as 44.44%) at concentration (10%) after 1 week. Highest mortality (44.44%) at concentration (10%) was observed on N. sativa. Rhyzopertha dominica, Insecticidal activity, Mortality, Concentration, Plant essential oil, Nigella sativa, Rotary evaporator, Sterilization, Stock solution. R. dominica (Bostrichidae: Coleoptera) is a serious pest of stored grains. It is found in the warmer regions of the world . It feeds on distinct food crops i.e., cereals and legumes made from wood . It is highly polyphagous. Many cereal crops were infested by the insect pests i.e., maize, rice and wheat . Due to attack of R. dominica, the infested grain decreases in value in milled products. Adults have strong mouth parts which are used to bore into grain. The ability of strong flight and widely polyphagy, scattered with the fact that R. dominica has been trapped in distinct environments that indicates the pest shifting between natural territory and facilities of grain storage. R. dominica are 0.1-inch long. These beetles are cylindrical and dark brown. Approximately, 450 eggs are laid. The larvae molt 2-5 times. Then, pupation takes place in the grain. Larvae are free living. They become scarabaeform. Adults are voracious feeders of grains. Adults remain hidden inner softer part of the seed . It is very important to utilize plant oils for protection of stored grains because they have low toxicity, high bio-degradation and eco-friendly environment when it is used. It should need to pay attention to apply these essential oils of plants in stored grains to control insect pests . The Obeng- Ofori observed the results of R. dominica as mortality (100%) in form of protection by plant oils of cotton seeds, Soybean and maize etc. The Xie et al. the suitability of extracts Melia plant as bio-pesticides and 48%-99% control can be achieved by different concentrations. The essential oil of N. sativa was estimated for toxic effects on R. dominica to show potent dose rate, by keeping at minimum concentration and observation for their direct toxic effects. Nigella sativa is a conspicuous herb. It has a wide range of medicinal properties. It is a spice yielding plant by commercial significance. N. sativa seeds are used in medicine as herbal in all over the world for the prevention of diseases. N. sativa oil contains plant sterols, oleic acid (25%), linoleic acid (55%), nigellone, and volatile oils including limonene and thymol. N. sativa oil an important role as anti-septic, anti-pyretic, anti-inflammatory, anti-allergic, anti-microbial, anti-oxidant and other desirable properties. It is clarified by some studies that N. sativa has positive effects on blood pressure, on blood sugar with diabetes and on memory in people. It is needed more research to understand both the positive and negative effects of N. sativa on human health. Some scientific evidences to offer that N. sativa help to prevent pregnancy, to reduce swelling, to boost the immune system and lessen allergic reaction by acting as anti-histamine and fight against cancer. But there is no sufficient information in human yet [6-8]. The research conducted at the Insect Pest Management Program, NARC, Islamabad in 2018. 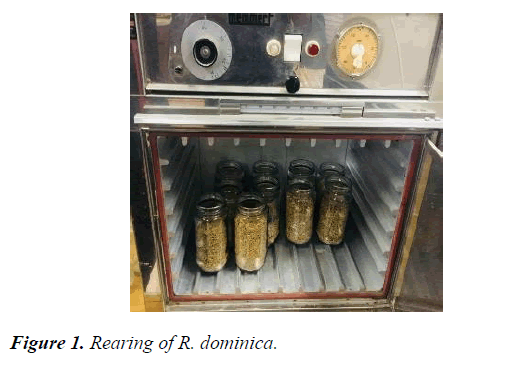 R. dominica collected from the Insect Pest Management Program (Stored grain Management) laboratory. The cultures formerly preserved in the sterilizer and insects’ jars covered with woven cloth, at 30ºC and 70% relative humidity. Wheat in jars was given to the R. dominica as a diet. R. dominica permitted to multiply as F1 generation (Figure 1). Figure 1. Rearing of R. dominica. N. sativa seed collected from National Agricultural Research Council, Islamabad. This water content in raw material was 8% and oil content was 50%. Repeatedly, N. sativa seeds washed to remove contamination. In Oven, the seeds dried at 50ºC. The material was grinded. In flask, 100 g material was taken. 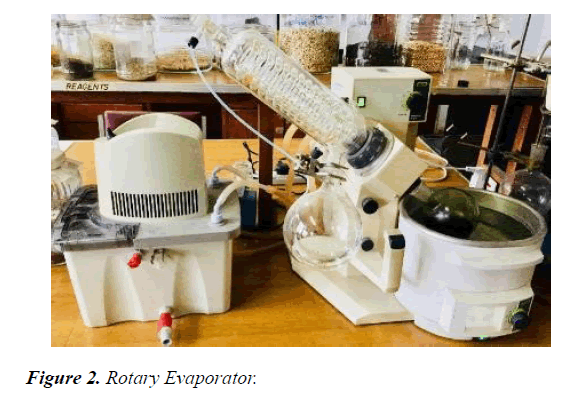 Oil extraction by rotary evaporator, using a solvent i.e., N. sativa seed in the form of powder and solvent taken at 1:5 ratios in flask to collect Ethanol acid at 30ºC. The extraction done for about 4-5 days and shaked 3-4 times in a day. The solvent filtered by filter paper. Then heated it and evaporated at 65ºC-70ºC. The solvent free N. sativa oil is obtained by Rotary evaporator. By putting the oil in flask, the remaining solvent traces were removed. Then, it was placed on a water bath at 65ºC-70ºC. This process done for 12 hours. The oil was weighed and its percentage was calculated. The pure oil put in a refrigerator. The flask heated at 65ºC by using electric mantle. In the evaporator, the solvent vaporized and condensed. The obtained solvent and oil kept in a bottle (Figure 2). Took few grains of wheat in a pan and then sieved in 10 number mesh pan. Then placed the grains on white paper. Insects sticked on white paper and removed the extra raw material. Then placed the insects in a jar with the help of camel hair brush. And cover the jar with cotton cloth with rubber septum. This method is used for Rhyzopertha dominica. 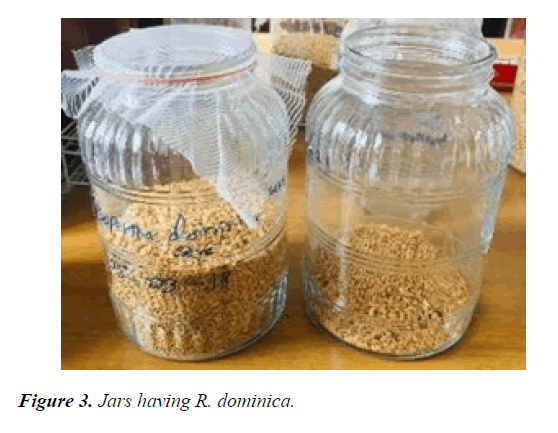 1 week new adults of Rhyzopertha dominica were obtained from the wheat’s jars by sieving method, separate the adults and put into empty jar for starvation (Figure 3). Figure 3. Jars having R. dominica. First of all, 1 ml N. sativa extract was taken and diluted with 9 ml acetone. This was 10% stock solution. Then took 3 ml from the prepared stock solution and added 5 ml acetone into it, in order to make 4% stock solution of N. sativa. 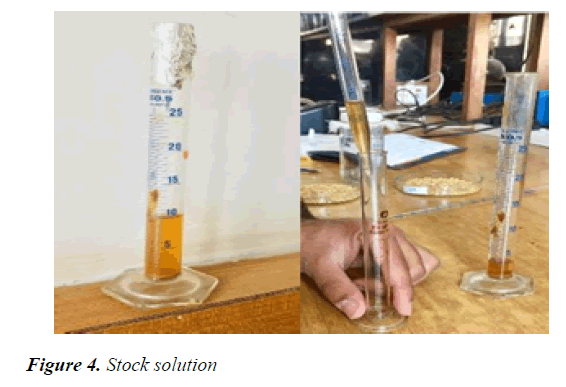 Above given step was repeated to make 2% and 1% stock solution of N. sativa extract (Figure 4). First of all, 200 grams of wheat variety (galaxy) kept in sterilizer for 24 hours at 60ºC-65ºC. After sterilization, weighted the wheat (30 g) for 15 petri dishes in N. sativa extract and wheat (50 g) for 5 petri dishes in acetone; took 20 petri dishes of 6 mm and 6 petri dishes 16 mm. First, washed all petri dishes and dried in sunlight. After drying, took 5 petri dishes of 16 mm and put 30 g wheat in each. 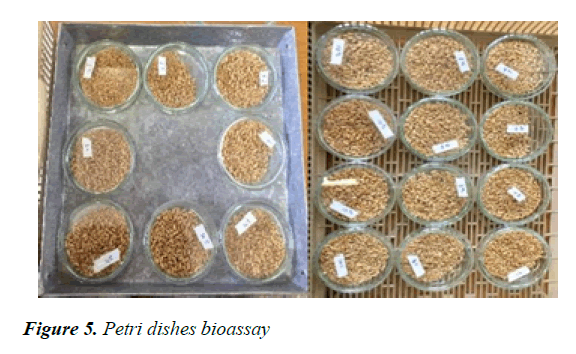 Then, put 50 g wheat in 16 mm petri dish for control replication (Figure 5). Stock solution (10%) of N. sativa made in acetone and prepared the solution of concentration (4%, 2%, 1%) from it. The solution (3 ml) on wheat applied in such a way that petri dish (30 g) treated with concentrations by using pipette. On this treated wheat (50 g), the acetone (5 ml) mixed uniformly for control purpose. Wheat (30 g) in 3 petri dishes and wheat (50 g) in 5 petri dishes divided for replication purpose. All petri dishes labelled according to its concentration and replication. Every treatment has 4 replications likewise treated and control (3:1). 20 insects of R. dominica dismissed in every replication. Then, dried this treated wheat for 1 hour and 20 adults (1 week old) dismissed in petri dishes. 3 petri dishes having concentrations (10%, 4%, 2%, 1%) of N. sativa solution (in acetone) were observed for 24, 48, 72 hours and 1 week respectively. The fourth petri dish (acetone) observed for 24, 48, 72 hours and 1 week. All petri dishes kept into growth chamber. All data collected at constant 28ºC-30ºC and relative humidity 65%-70%. By using utensils, data of mortality took after 24, 48, 72 hours and one week. The dead insects removed. The data noted on paper. Table 1. Percentage mortality of Nigella sativa on the R. dominica at different exposure time. Figure 6. Graph of Concentration and % Mortality. Table 1 showed that N. sativa had insecticidal impact against R. dominica at different concentrations. N. sativa applied to check the toxic effect against R. dominica at different susceptible periods. 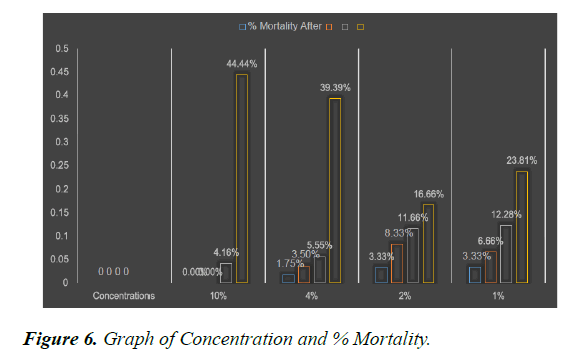 After 1 week, highest mortality observed nearly 44.44% in 10% concentration (Figure 6). N. sativa has some insecticidal properties according the above results. Further, it should be tested for its use. So that it could prove as safe grain protectant. In humans, N. sativa oil can cause allergic rashes if applied to skin. It can cause stomach upset, vomiting and constipation when taken by mouth. It can unsafe during pregnancy and breast- feeding. Sometimes, it can stop the uterus from contracting. N. sativa can slow blood-clotting and increase the risk of bleeding. I acknowledge with thanks to my training advisor and Program Leader Dr. Ehsan-ul-Haq (PSO), for providing all the facilities, expert advice and perceptive comments during the training course to carry out the training. A big share of thanks goes to my affectionate and loving friend Urooj Mazhar for her big contribution, kind help and their full cooperation in the laboratory. I pay my heartiest thanks to my sweet parents for their moral and financial support and also for their love, amiable attitude, and prayers for my success. Ukeh DA, Umoetok SBA. Effect of host and non-hosts plants volatile on the behaviour of lesser grain borer, Rhyzopertha dominica (Fab.). J Entomol. 2007;4(6):435-43. Edde PA, Phillips TW, Toews MD. Responses of Rhyzopertha dominica (Coleoptera: Bostrichidae) to its aggregation pheromones as influence by trap design, trap height and habitat. Entomol. 2005;34(6):1549-57. Hagstrum DW. Immigration of insects into bins storing newly harvested wheat on 12 Kansas farms. J Stored Prod Res. 2001;37(3):221-9. Vela-Coiffier EL, Fargo WS, Bonjour EL, et al. Immigration of insects into on-farm stored wheat and relationships among trapping methods. J Stored Prod Res. 1997;33(2):157-66. Ogendo JO, Kostyukovsky M, Ravid U, et al. Bioactivity of Ocimum gratissimum L. oil and two of its constituents against five insect pests attacking stored food products. J Stored Prod Res. 2008; 44(4):328-334. Collins DA. A review of alternatives to organophosphorus compounds for the control of storage mites. J Stored Prod Res. 2006;42(4):395-426. DeCarvalho CC, DeFonseca M. Carvone: Why and how should one bother to produce this terpene. Food Chem. 2006;95(3):413-22. Siddiqui BS, Ali ST, Tariq RM, et al. GC-based analysis of insecticidal constituents of the flower of Azadirachta indica A. Juss. Nat Prod Res. 2009;23(3):271-83.